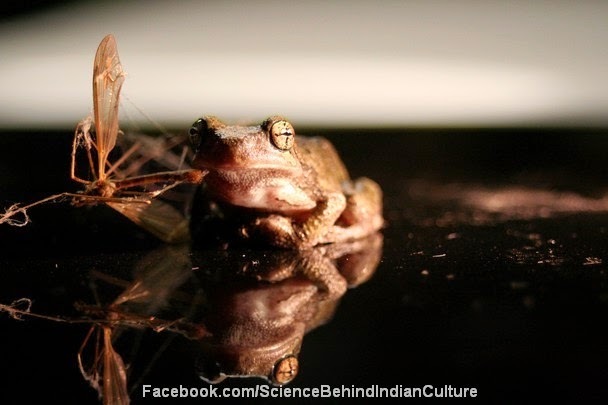 Home Hindu Frogs are a part of Indian Culture, But Why ? In india culture frogs have a significant role.. Indians make frog marriages in the name that these marriages will result in Rainfall. In Indian villages still we can find and see these frogs in temples, streets, at wells(baavi in telugu), at farms, almost every where especially at nights. Sometimes in our houses too(well they don’t need permission to get in). Villagers don’t kill them though they were entering into our houses and scarying us. Because they believe that they part of Indian culture and tradition. So they won’t harm those frogs. As we all know Indian villagers are a bit more addicted to our traditions than the urban people. Frogs are very much helpful to control the population of mosquitoes which results in preventing malaria and other diseases spread by mosquitoes. Naturalists and Medical researchers are saying that the increase in population of frogs is so much needed inorder to control these diseases. In the past 5 years almost Ten’s of thousands of people were effected with malaria. In olden days we don’t have this much of trouble with mosquitoes as frogs eat the larva(eggs of mosquitoes) which are usually found in drainages, mud and water stored places, near ponds, in the rain water that is stored and left in some places. Now a days there’s a very big market for frog legs, so many frogs were killed and their legs were being exported to countries like china. In fact in the entire sub-continent frog’s race is going to end said by Naturalists. 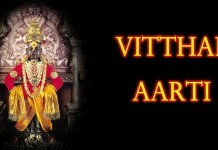 Ancient Indians are very talented, smart and they are good in guessing the mind set of future generation people. That’s why they included all these scientific things in the culture and named them as a tradition, exactly, made them as a part of our tradition, so that we won’t rule them out. 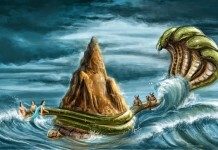 A symbol of reincarnation, the frog is likened to the many forms a soul may be reincarnated. The word “Manduka” is Sanskrit for frog, literally meaning the “Frog Upanishads”. The book explains the meaning of the sound AUM as three stages of consciousness – A: Wakefulness; U: Dream state and M: deep sleep. This Upanishad describes how yogis and munis leap from like “manduka” and vault themselves from the waking and dream states straight into the consciousness of the third state of bliss “sushupti”. 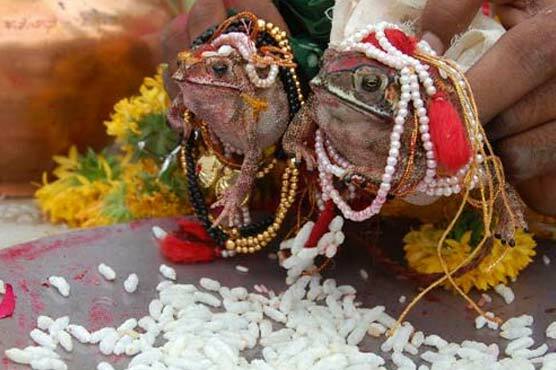 Residents in central and western India host wedding feasts for frogs to appease rain gods. In a ritual aimed at appeasing Lord Indra, the Hindu rain god, residents in central and western India host wedding feasts for frogs amid pomp and ceremony on Saturday (June 30).Indeed, they were disappointed at the delay in the onset of the southwest monsoon and also over the less than favourable predictions of the weatherman.Consequently, most of the residents in central and western India looked for divine intervention to provide them with respite.At Chhatarpur in the central province of Madhya Pradesh, residents performed a traditional Hindu wedding, but the bride and groom were frogs, and not human being.The wedding was performed under the supervision of Bharatiya Janata Party (BJP) legislator Lalita Yadav.A group of women sat with the frogs during their wedding, singing songs and dancing while the amphibians were anointed and led through the ceremonies that aimed to appease Indra, the Hindu god of rain.To please Lord Indra, the divine entity of rain, we have married two frogs. Our elders say that this ritual invokes the infinite mercy of the Lord, and there is rainfall. We have prayed for plentiful rains this yea, so that there is prosperity in our region and our farmers remain happy. Bundelkhand is a thirsty region, and receives less rainfall than others, said Lalita Yadav.The priest who solemnised the unique wedding rituals, Pandit Munna Arjariya, said that the ceremonies had been performed in accordance with Hindu scriptures.According to Hindu rituals, the wedding started with an anointment of vermilion, followed by a sacred offering, then the solemnisation of the union and a Havan (fire ritual) was performed. The ceremony ended with the departure of the bride, said Pandit Arjariya.A similar ceremony was performed at Nagpur, the orange and cotton belt in the western state of Maharashtra, where people gathered for a colourful ceremony, raining marigold petals on the frogs that got married.The revellers said that rains were essential to the livelihood of farmers in the region. Previous articleWhy we should not stitch clothes at night time?